iPro software is a leading CRM booking management system custom built for vacation rental businesses, be they small or large! After an easy integration with your website, this software will allow you to manage every user throughout their journey - from the moment they contact you, to the moment they depart their holiday accommodation. Hence you can manage all of your contacts, leads and rental bookings from one simple online booking software, accessible to you from any device, anywhere. View vacancies, current bookings as well as any upcoming reservations and events through iPro Software’s calendar. With access to real time availability, arrivals and departures (or check ins and outs), you can take accurate reservations 24/7. Give clients the best booking experience and ultimate customer satisfaction by showcasing high resolution photos of your individual available rooms. With a personalised dashboard configured to reflect your business model, this can clearly reflect your business priorities with data that is readily accessible and easy to digest. A simple way to help you grow and manage your business! Access a wealth of business intelligence to track trends and business growth through the reports and analytics function of the PMS. 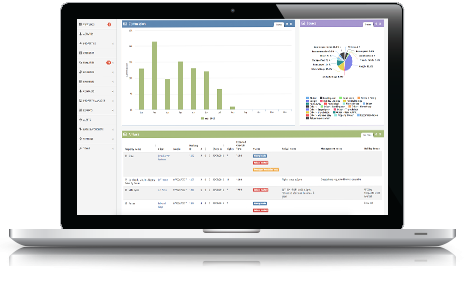 Predict patterns, monitor revenue and identify where your business is coming from, all from one customizable property management dashboard. With configurable alerts and push notifications, your admin workload will be dramatically reduced as information regarding accommodation bookings, payment statuses and incomplete information will be automatically sent to the right person. Increasing or modifying alerts can be easily done from the control panel. On the go? iPro’s cloud based PMS is compatible with mobiles, tablets and desktops, allowing you to access your business data from anywhere and at any time. iPro accepts the most popular payment providers, including PayPal, Sage Pay, Worldpay, UPG, CardSave and Cardlink, as well as allowing for transactions in a huge variety of currencies so you can accept holiday bookings from all over the world. With sliding scale licensing from Life to Diamond packages and fixed monthly fees, iPro grows as your vacation rental business does. What’s more, we don’t charge any commision on bookings! ​If you’re ready to upgrade, iPro Software enables easy migration of property and customer data from your current systems for a stress-free installation. Please contact the team for more information, or arrange your free booking management software demo today!